The classic story of boy meets girl, set in Rydell High School, is back on tour this summer! Although starting its life as a Broadway musical in 1971, it wasn’t until the global success of the 1978 film that Danny, Sandy and the gang became a beloved part of popular culture. And judging by the crowds of people at the theatre, both the characters and the story still resonate with people today. Having won the hearts of the British public back in 2010 winning the BBC’s Over the Rainbow series, Danielle Hope was the perfect choice for Sandy. Her innocence and charm, coupled with the dulcet tones of a seasoned leading lady made for a thoroughly enjoyable performance. Playing opposite Danielle, as heart-throb Danny Zuko is Tom Parker. 1/5 of boyband The Wanted, Grease is Tom’s theatrical debut and sadly his lack of experience began to show over the course of the performance with stilted dialogue not quite expressing the effortless aura of cool the role requires. However, his energy and enthusiasm didn’t falter and he seemed to thrive alongside his loyal T-Birds in the Greased Lightnin’ number. As Danny’s charismatic friends Kenickie (Tom Senior), Sonny (Michael Cortez), Doody (Ryan Heenan) and Roger (Oliver Jacobson) had a natural rapport with one another, working well as a group as they moved from one mischievous antic to the next. Unfortunately the Pink Ladies, did not create the same level of fun and friendship. As leader, Rizzo is a much loved character, despite her hard faced character and often cutting wit. However, Louisa Lytton’s lacklustre performance failed to capture her endearing qualities, especially during the poignant There Are Worse Things I Could Do, and faded into the background in the group numbers. The standout performance for the girls was definitely Rosanna Harris’ Jan. Labelled as ‘the funny one’, she did not disappoint. Her comedic delivery was brilliant, enhanced further when working alongside Oliver Jacobson’s Roger, and their powerful vocals made an often-overlooked Mooning memorable. Terry Parsons’ set was basic but effective with era appropriate backdrops including the iconic school bleachers. Another must for this show is Greased Lightnin’ herself. Moving on and off the stage with ease, the car’s transformation provided the perfect backdrop for the boys’ fantasy sequence. Key to Grease’s sustained success is its music; from one catchy number to another, both the songs and legendary dance moves continue to enthuse generation after generation. 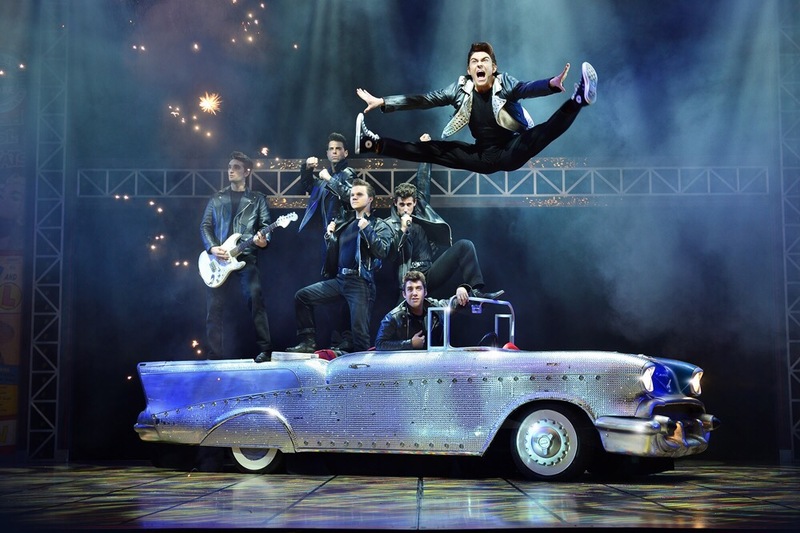 This ensemble embodied the uplifting essence of the show, performing slick, dynamic choreography with boundless energy whilst staying true to the rock and roll era. Throughout the evening the atmosphere in the theatre was a combination of enthusiasm and enjoyment and if you’re looking for a night of entertainment.. Grease is most definitely still the word! On Sunday night, Giggin4Good held their tenth charity concert at the Actors Church, Covent Garden. Produced by Emma Howe, Hayley Guild and Karen Howe with the help of Nathan Lodge and Jordan Langford, they set out to raise money for the Soi Dog Foundation (in which Nathan and Jordan had visited earlier in the year). The evening hosted by Benjamin-Vivan Jones, featured a line-up filled with West End stars, a raffle with great prizes and a set-list of dreams. It really was one not to be missed. Featured performers from the night included Christine Allado, Andrew Bateup, Adam Bayjou, Luke Bayer, Danny Colligan, Nicole Faraday, Harry Francis, Luke George, James Gillan, Chlöe Hart, Houston Girlband (Lauren Byrne, Holly-Anne Hull, Charlotte Steele), Danielle Irvine, Jordan Langford, Nathan Lodge, Robert McNeilly, The MTA, Mikaela Newton, Daisy Steere, Savannah Stevenson, Benjamin Vivian-Jones and Emma Williams. The setlist included such a variation of songs from Dear Evan Hansen to Moana to Hamilton and it was great to see the West End get together to support such a fabulous cause. Equally it was great to see them away from their shows, singing songs from others. Highlights for us were both Savannah Stevenson and Emma Williams solo numbers, the MTA and the group performance of Waving Through A Window. Needless to say, everyone performed incredibly and the talent in the room was off the scale. What made the evening extra special was the amount of people that had came to support. The church was filled to the brim with budding theatre goers, friends and family and the Soi Dog’s founder, John Dally. Joking that he actually wasn’t over from Thailand just for this event but feeling appreciative that it feel within the same dates of his travel, John took to the stage to say a few words about the hard work the foundation does. An avid Theatre lover himself, he spoke of his wife Gillian who sadly passed away earlier in the year and their passion for the arts. One of the duets in the evening Miss Saigon “Last night of the world” sung beautifully by Savannah Stevenson and Adam Bayjou was a special tribute to Gillian as it was from her favourite musical and one the pair had seen many times. The evening also paid tribute to the Manchester attack by having a one minute applause to honour the victims and their families. That was a particularly special moment to be apart of and felt nice to applaud rather than have a moment of silence. It really was a fun evening, filled with so much love and light. Whenever you attend an evening that recognises and appreciates the work of a cause, it really does feel so great to be apart of. Huge congratulations to the Giggin4Good team alongside both Nathan and Jordan for putting together something so special and one that we were happy we could attend.